Since June is the traditional month of weddings, there are usually lots of weddings to be expected. 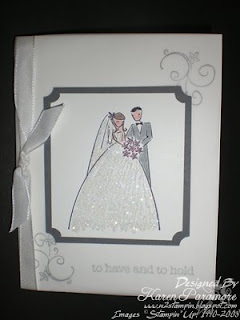 I just love this wedding stamp set "To Have and to Hold". 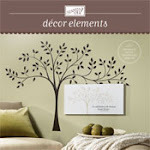 It has simple lines with a touch of elegance. It is just calling for some vellum paper and lots of glitter! This card we made at one of my club groups last month. We had a wedding theme party and even had a mini wedding cake! It was great! We stamped our projects while we watched the movie "27 Dresses" on DVD! I just love that movie, don't you? If you've not seen it you should! It is so cute! There are so many great "wedding" theme movies we could have picked to watch; "The Wedding Planner, Runaway Bride, The Bachelor, Father of the Bride" so on and so on..., but "27 Dresses" was the latest wedding movie out and not everyone had seen it! Anyway back to the card; I knew that I wanted to use vellum in some sort of way and also lots of glitter. This is what I came up with. I hope you like it...the ladies in my club all seemed to. The vellum on the front of the card is held in place in the center of the card and the "Bride & Groom" are stamped on white card stock and mounted on the Basic Gray piece then placed over the vellum. The ribbon on the side helps hold the vellum down at the edges. We also made a couple of other cards at this club party which I will post later. One of them was a gift card holder that I learned how to fold and make at a SU regional seminar that I attended in Orlando recently. Thanks for stopping by today! Let's go stamp something! This will make such a beautiful and elegant wedding card. You gave good instructions too! I think I will try to make some for upcoming weddings this summer. I love the glitter!